A huge part of who we are at Social Pie revolves around being able to give back to our community. In earlier blogs, we have talked about two of our three charities that we are featuring, currently—so it is only fair that we talk about all three of them! Last, and certainty not least, we have WiNGS for Women and Families. A very important, helpful, and amazing non-profit that you can give back to by merely coming in, ordering a pizza, and choosing WiNGS as your chosen charity! WiNGS has a mission, and that is to provide both families, and women, a path to a better life—something that they not only want to do, but they promise they will do. Through this, WiNGS has created something they call The Promise Campaign. This campaign is important because it is used to help the growing poverty that is in the Dallas Community. Specifically, those that are in poverty are disproportionately women and children—and this campaign aims to do something about that. By you coming in and eating a Social Pie, you can add to this $8 million campaign goal—so far they have already collected a little over $4 million! WiNGS is a place for women to go get help—it is not only a trusted place for women, but many women have already transformed their lives from the help of WiNGS’ different programs. They offer different solutions to help women through tough times—poverty and adversity, namely. To do this, they equip these women with the tools necessary to have strong families, and create strong communities. Some of the programs that WiNGS offers are: financial education, work skills support, education on pregnancy and parenting, and how to develop a small business. No matter what program a woman goes through, the goal is to transform their life. There are many different, and helpful, ways you can help out WiNGs—and simply eating at Social Pie is one of them. Remember, a percentage of every single pizza sale goes toward your chosen charity! 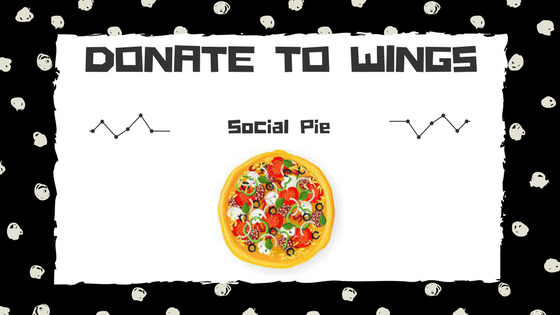 We have made donating to important causes as simple as coming in to Social Pie and eating a pizza! Remember, we change our charities every few months—and you can vote for which one you want to see next! All you have to do is click (or write in) your favorite option here. We want to give back whenever possible, and we can only do this with your help! Celebrate National Pizza Month at Social Pie!